As every year, local and regional governments celebrate Urban October which kicks off on 1 October with World Habitat Day and will end on 31 October with World Cities Day. World Habitat Day is an opportunity to reflect on the state of our towns and cities. The theme of the 2018 World Habitat Day is “Municipal Solid Waste Management”, a key policy area to achieve SDG 12 and a long-standing priority for UCLG members. On this occasion, UCLG recalls the importance of shifting consumption and production patterns from the territories to waste-free societies. In 2010 it was estimated that every day 0.8 kilograms of waste is produced by every person in the world. The amount of total waste generated is expected to triple to 5.9 billion tons a year by 2025, due to increased consumption and ineffective management strategies. A change of the current economic model is needed in order to transition towards a zero waste society. This change needs to be accompanied by a shift in public attitudes towards an efficient use of natural resources, minimizing waste, as well as recycling and reusing. These new attitudes should help municipalities improve the current state of solid waste management in an urban context. Local and regional governments have a specific role to play in fostering sustainable consumption and production. Only by playing our part in shifting public attitudes towards consumption and production, will we be able to co-create with our citizens and our communities a new model of sustainable production and consumption, and transition towards a society with zero waste. Being the closest level of government to the people, we are the sphere of government that is best-placed to provide our communities with the knowledge and tools to reduce their environmental footprint, and we have the responsibility to do so. Furthermore, intermediary cities are uniquely placed to work jointly with rural neighbourhoods, communities and workers to foster decent jobs and reinforce exchanges between the agricultural areas and the economic centre(s). Ensuring sustainable production and consumption patterns throught Local Economic Development has been a pivotal priority for UCLG. 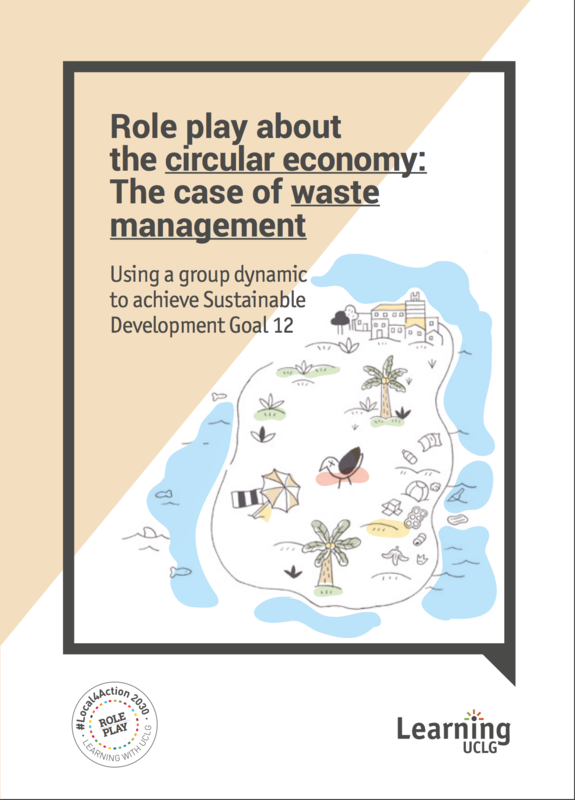 We developed a Role Play “Role play about the circular economy: The case of waste management” that aims to raise awareness on the circular economy and the variables which influence decision-making on waste management. A circular economy aims to redefine growth, gradually decoupling economic activity from the consumption of finite resources, and designing waste out of the system. Underpinned by a transition to renewable energy sources, the circular model builds the economy from its roots: the local economy and the regeneration of natural systems. Through the UCLG Committee on Local Economic and Social Development UCLG addresses more profoundly the processes of decentralisation and regionalisation and promotes sustainable and inclusive economic growth. However, local and regional governments often lack the necessary resources and means to carry out this endeavour. Therefore, on the World Habitat Day we call on the international community to strengthen the financial and institutional capacities of local and regional governments to guarantee access to sustainable financial resources. Otherwise, local and regional governments will not be able to play they role in the achievement of sustainable waste management.